JNN 23 May 2014 Abuja : Nigerian notorious Wahabi Boko Haram Terrorist killed 48 villagers in northeastern Nigeria near the town where they kidnapped 300 schoolgirls. 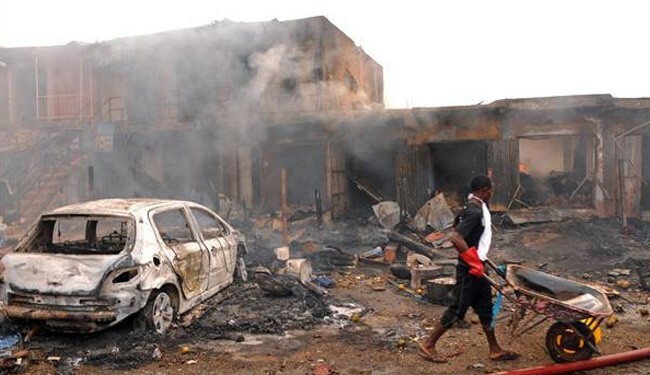 The latest Terrorism developments came hours after twin car bombings claimed at least 130 lives in this central city _ an escalating campaign of violence Injected by the Wahabi Boko Haram terrorist network and its drive to impose a self-ruled state on Nigeria. Nigerian President Goodluck Jonathan swiftly condemned the Tuesday attack in the central city of Jos, calling it a “tragic assault on human freedom” and condemning the perpetrators as “cruel and evil”. But the deadly strike and a car bomb attack that killed four in the northern city of Kano on Sunday, will raise fresh questions about the government’s grip on the country’s security. Jonathan has already faced calls to quit for failing to ensure the safety of Nigerians and their property as well as come under criticism for his lacklustre response to the kidnapping of more than 200 schoolgirls by Boko Haram militants. An international team, including specialists from the United States, Britain, France and Israel are involved in the hunt for the 223 teenagers, who were abducted in the remote northeastern town of Chibok on April 14. In Jos, the coordinator of the National Emergency Management Agency (NEMA), Mohammed Abdulsalam, said buildings collapsed because of the intensity of the blasts in the New Abuja Market area, causing raging fires. The military said improvised explosive devices were hidden in a truck and a minibus. The second went off about 20 minutes after the first, as emergency service workers tended to the victims. Most of the victims were women, added Pam Ayuba, spokesman for the state governor, Jonah Jang. There was no immediate indication of who was responsible for the latest attacks, although the police in Kano said they had arrested two men in connection with Sunday’s bombing, without giving more details. African Countries Ready and United to Wage War Against Wahabi Boko Haram Terrorists. Countries neighboring Nigeria are ready to wage war against the Nigeria-based, al-Qaeda-linked group, Boko Haram, Chad’s president says. Idriss Deby made the statement after a summit in Paris on Saturday that also included Nigerian President Goodluck Jonathan and representatives from West African countries Cameroon, Benin, Niger plus the United States, the European Union, Britain and France. “There is determination to tackle this situation head on…to launch a war, a total war on Boko Haram,” Deby said after the meeting, which was aimed at finding a common strategy to fight the armed group. French President Francois Hollande had called the summit following the kidnapping of hundreds of schoolgirls in Nigeria last month. The leaders who attended the meeting agreed on tightened border controls, shared intelligence and to take a collaborative approach when fighting the armed group. Jonathan said Boko Haram had evolved from a small group to being part of the broader al-Qaeda organization. “Boko Haram is no longer the local terror group with some regional sentiment that started in Nigeria in 2002 to 2009,” Jonathan said. Francois Hollande, the French president, said Boko Haram had clearly established ties with other “terror” groups in Africa, making it a problem throughout the continent and beyond. “The message we want to send is that we know the threat. It is serious, it is serious for the region, for Africa and so for Europe. We have deployed our military and intelligence system to find these young girls,” Hollande said. The 276 schoolgirls and women were kidnapped on April 15 from a school in Chibok. Most of them are still being held captive, with the group’s leader threatening to sell them into slavery. In February, another 59 students were killed when fighters attacked a boarding school in Yobe state, setting several buildings on fire. Two bombs also exploded in a crowded bus station in Abuja on April 14, killing 88 people and injuring more than 200 others. This entry was posted in AFRICA and tagged Abuja, Africa, African States, Boko Haram, France, Goodluck Jonathan, Idriss Deby, intelligence, Jos, Nigeria, Nigerian President Goodluck Jonathan, President Goodluck Jonathan, Terrorism, the state governor, Wahabi Boko Haram, West African countries Cameroon. Bookmark the permalink.